The use of additives in food is a dynamic one, as consumers demand fewer additives in foods and as governments review the list of additives approved and their permitted levels. Scientists also refine the knowledge of the risk assessment process as well as improve analytical methods and the use of alternative additives, processes or ingredients. Since the first edition of the Food Additives Databook was published, there have been numerous changes due to these developments and some additives are no longer permitted, some have new permitted levels of use and new additives have been assessed and approved. 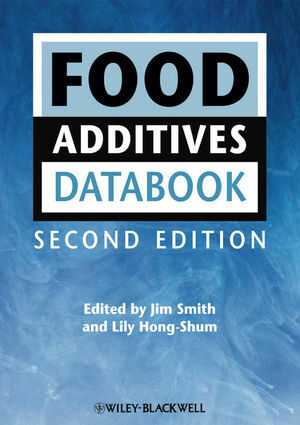 The revised second edition of this major reference work covers all the "must-have" technical data on food additives. Compiled by food industry experts with a proven track record of producing high quality reference work, this volume is the definitive resource for technologists in small, medium and large companies, and for workers in research, government and academic institutions. "Additives have their advantages for the food industry in order to provide safe and convenient food products. It is therefore essential that as much information as possible is available to allow an informed decision on the selection of an additive for a particular purpose. This data book provides such information - consisting of over 1000 pages and covering around 350 additives. Jim Smith studied Food Science in Glasgow, Winnipeg and Nottingham and has worked in the food ingredients industry as technical manager as well as in a scotch whisky distillery in both production and quality control. He taught, researched and consulted at Strathclyde and Caledonian Universities in Glasgow for six years before moving to the Prince Edward Island Food Technology Centre, Canada as Senior Food Scientist in 1988. He has been Executive Director of the Centre since 2003. Jim is a member of the United Nations/World Health Organisation Joint Expert Committee on Food Additives and has edited three books on food additives. He is President of the Canadian Institute of Food Science & Technology and vice-chair of FoodTech Canada, a newly-formed network of Canada's food tech centres whose aim is to commercialise new food products. Ascorbic acid and isomers (L-ascorbic acid and erythorbic acid). Citric acid and its salts. Rosemary extract; natural spice extract. Tocopherols, mixed a (DL), g and d (synthetic). Ethyl ester of beta-apo-80-carotenoic acid (C30). Acetic acid esters of mono- and diglycerides of fatty acids. Citric acid esters of mono- and diglycerides of fatty acids. Diacetyl tartaric acid esters of mono- and diglycerides of fatty acids. Ethoxylated mono- and diglycerides of fatty acids. Lactic acid esters of mono- and diglycerides of fatty acids. Mixed acetic and tartaric acid esters of mono- and diglycerides of fatty acids. Mono- and diglycerides of fatty acids – saturated. Mono- and diglycerides of fatty acids – unsaturated. Polyglycerol esters of fatty acids. Propylene glycol esters of fatty acids. Sodium, potassium, calcium and magnesium salts of fatty acids. Sorbitan esters of fatty acids. Succinic acid esters of mono- and diglycerides of fatty acids. Sucrose esters of fatty acids. Tartaric acid esters of mono- and diglycerides of fatty acids. Natural tocopherols (mixture of d-a, d-b, d-g, d-d tocopherol forms). Lactic acid (D, DL or L).